Three weeks from our last update on this blog. Time flies when you are busy! 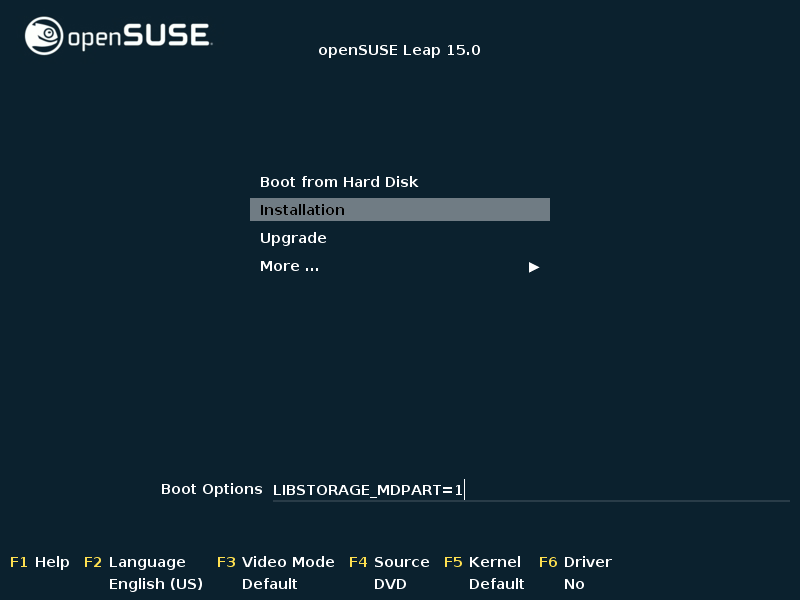 As you know, openSUSE Leap 15.0 was released in the meantime, which also means the active development of SLE15 is coming to an end… so time to look a little bit further into the future. That’s why we had a face-to-face workshop with the whole YaST Team at the beautiful city of Prague during several days right before joining the openSUSE Conference 2018. But we have done much more in three weeks than attending workshops and conferences. Apart from last-minute fixes, here you have a list of some interesting changes we have done in YaST in this period. Take into account that some of these changes didn’t make it into Leap 15.0, although all will be available in SLES15 and are probably already integrated into openSUSE Tumbleweed. As you may know, the default installation of SLE and both openSUSE distribution enables Btrfs snapshots in the root partition alongside separate partitions for /home and swap. That means a default installation needs quite some space. In SLE12 and openSUSE Leap 42.X, if such disk space was not there the installer silently tries to disable the separate /home and even the snapshots in order to be able to create an initial proposal. That behavior has become configurable for each product and role with Storage-ng and during the last sprint there was some controversy about what the configuration should be, both for openSUSE and the SLE family. It may look like a minor problem, but it becomes very relevant in virtualization environment (where virtual disks smaller than 10 GiB are not uncommon) or certain architectures with special storage devices like s390 and ARM. 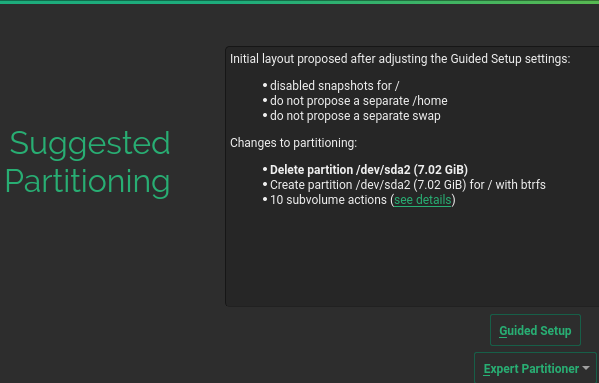 The final decision was to never disable snapshots automatically in the case of openSUSE, so the user will be forced to manually go through the Guided Setup and explicitly disable snapshots to install in a small disk. In the SLE case, it was decided to keep the traditional behavior (automatically disabling snapshots if really needed) but making the situation more visible by adding a previous sentence to explain how the initial proposal was calculated. So the installation in a normal disk would look like this. While the installation in a very small disk displays some information similar to the following screen (the wording was slightly improved after taking the screenshots). The explanatory text preceding the list of actions will be available in all products based on SLE15, but will not be there for Leap 15.0, since the modification to the installer was not ready on time for the deadline and, moreover, would have been impossible to get the translations on time. By the way, if you are interested in a more in-depth explanation on how the partitioning proposal adapts to all kind of situations like small disks and other scenarios, don’t hesitate to check Iván’s presentation at openSUSE Conference 2018 detailing its internals. And talking about uncommon scenarios and the s390 architecture, you may remember that in the latest sprint we improved the handling of the persistent network device names kernel parameter for such systems. Shortly after, we found out a similar improvement was needed also for the FIPS parameter. FIPS is a military encryption standard in USA. If the installation is started using the corresponding parameter, YaST will enforce strong encryption and will install an specific FIPS pattern. Moreover, after the recent fix, a system installed in hardened mode s390 will continue operating in this mode after the installation. As SLE15 comes closer, future users start testing the system with more exotic and complex hardware setups. Same applies to openSUSE Leap 15.0 right after the official release. As a result of all that testing, we found several scenarios in which Storage-ng got confused about MD RAIDs defined by some specific hardware or manually by the user before starting the installation. By default, the old storage didn’t handle partitions within software RAIDs and it didn’t handle software RAIDs directly on top of full disks (with no partitions in the physical disks). For the first version of Storage-ng present in Leap 15.0 and SLE15, we tried to implement the same behavior with the intention to rethink the whole thing and open new possibilities in the close future. Check more about the present and future of Storage-ng in Ancor’s talk at openSUSE Conference 2018. Unfortunately, while trying to replicate the old storage behavior with software-defined MD RAIDs, we overlooked some heuristic that was hidden in the old implementation to recognize some special setups in which a given RAID device currently detected as regular software-defined RAIDs should be treated like hardware RAIDs. That’s the case of Software RAID Virtual Disks defined on a S130/S140 controller on DellEMC PowerEdge Servers through the BIOS Interface. We also found that some users used to produce a similar situation by manually creating software MD RAIDs and creating partitions within them before starting the installation. With the preparation of SLE15 already in the final stages and with openSUSE Leap 15 already out, it was too late to introduce drastic changes in how MD RAIDs are detected and used. To mitigate the problem while limiting the potential breakage, we reintroduced an ancient installer parameter. Now, when we run the installer using LIBSTORAGE_MDPART=1, all existing software-defined RAIDs will be considered as BIOS RAIDs. The new parameter is not available in Leap 15.0 (we added it too late) and will hopefully not be necessary anymore in future versions of SLE and openSUSE, since the short term plan is to redesign everything about how MD RAIDs are handled during installation. Another example of RAID that looks like defined by software but is indeed assembled by BIOS is the Intel RSTe technology. In this case, the usage of LIBSTORAGE_MDPART is not needed, but still we found the bootloader installation to be broken because YaST was once again getting confused by the mixed RAID setup. Fortunately it was possible to fix the issue and verify the solution in only two days, despite the YaST Team not having direct access to the hardware, thanks to the outstanding help of the user reporting the bug. Connecting users and developers directly always produces great results… and that’s one of the reasons open source rocks so much! That was not the only improvement in the bootloader handling done during this sprint. 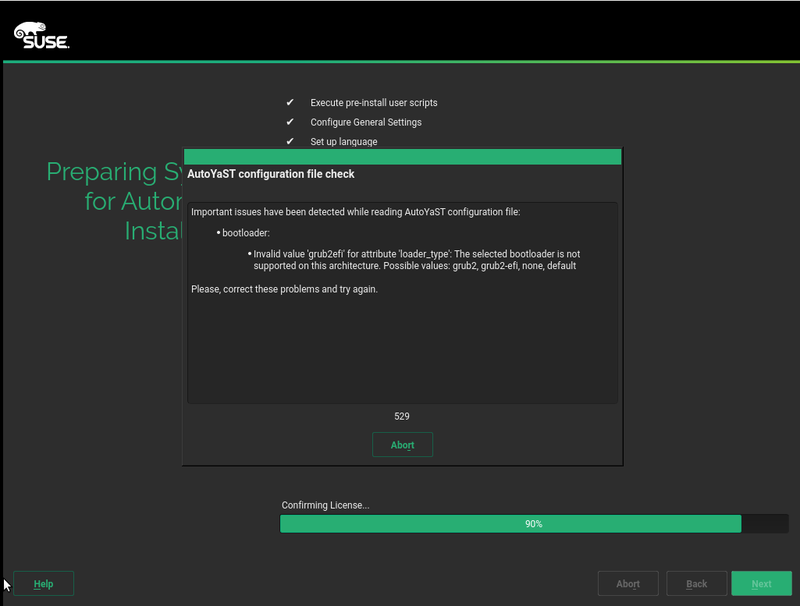 We also invested some time improving the user experience in AutoYAST, since the error message displayed when using an EFI variant not supported in the system architecture was far from being useful or even informative. So alongside a more clear message, AutoYaST will now list all the possible values supported on the given architecture to better guide the user. AutoYaST also received improvements in other areas, like making use of the new possibilities offered by Storage-ng. The new storage layer allows the user to set different default subvolumes (or none at all) for every Btrfs file system. As shown in the example below, a prefix name can be specified for each partition using the subvolumes_prefix. 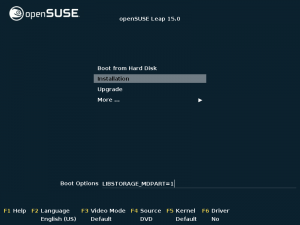 As a consequence of the new behaviour, the old btrfs_set_default_subvolume_name tag is not needed and, therefore, it is not supported in Leap 15.0 and SLE15. 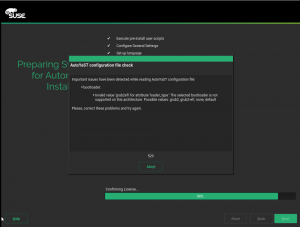 And more changes in AutoYaST that arrived just in time for SLE15 and openSUSE Leap 15.0. Recently, we have introduced a new flag in AutoYaST partition sections to skip the creation of Btrfs subvolumes because, due to a known limitation of our XML parser, it is not possible to specify an empty list. So from now on, setting create_subvolumes to false will prevent AutoYaST from creating any Btrfs subvolumes in a given partition. As usual, the content of this post is just a small part of everything we did during the sprint. There were also many other fixes and improvements, from auto-repairing wrong partition tables (with different sizes than the underlying disk) during installation to better interaction with other components like udisk or mdadm auto-assembling and many other things in between. But it’s time to go back to work and start implementing all the new ideas that emerged from the YaST Team Workshop and the openSUSE Conference. See you in the next report!